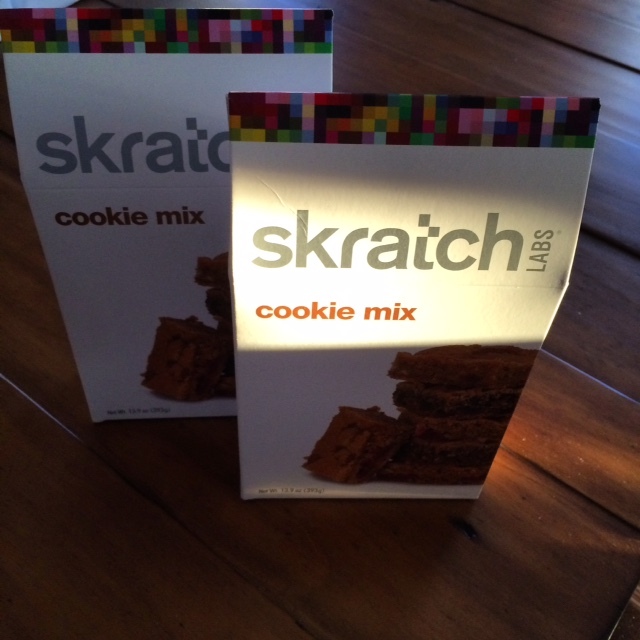 *disclaimer: I was provided with two packages of skratch LABS cookie mix for my review as a skratch taste agents. All of my opinions are 100% my own. 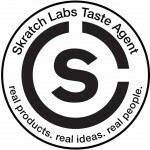 In case you hadn’t yet heard I am proud to be a skratch LABS taste agent. I became hooked on skratch after my mom discovered it in a newspaper article and passed it along as something that I might like to try to help me stay hydrated. Now skratch LABS has expanded their offerings to include daily electrolyte mix, exercise hydration mix, rescue hydration mix, hyper hydration mix and now COOKIE mix! Ingredients: Enriched Wheat Flour ,Brown Sugar, Cane Sugar, Oats, Sea Salt, Baking Powder, Vanilla Extract, Baking Soda, Cinnamon. After that all you need to do is add 1 stick of butter at room temp, 1 egg (I used two organic eggs) and then you can get creative with add-ins. 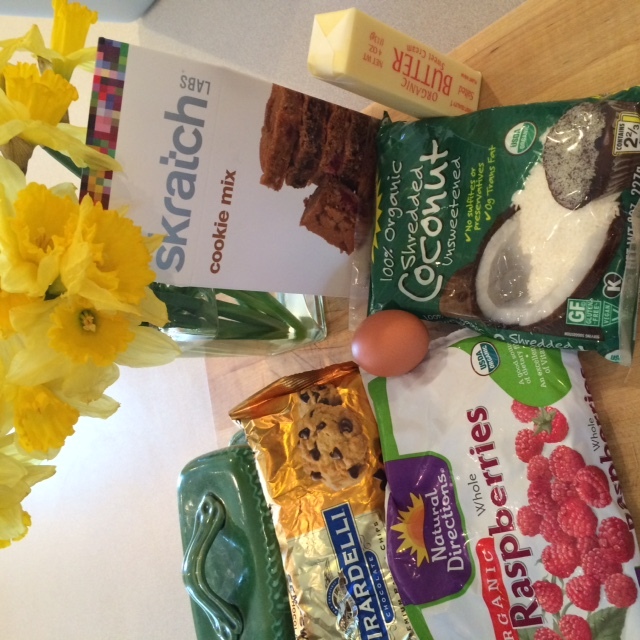 The cookie monster in you will love @skratchlabs cookie mix, oh and there’s a #giveaway too! 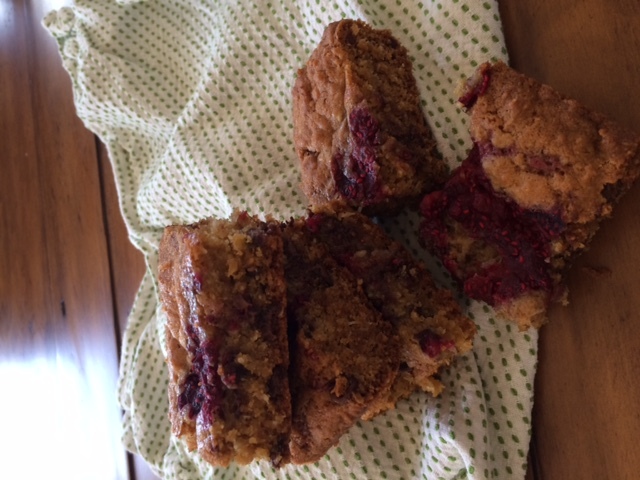 This mix was quick and easy to mix up and can either be made into cookies or bars. 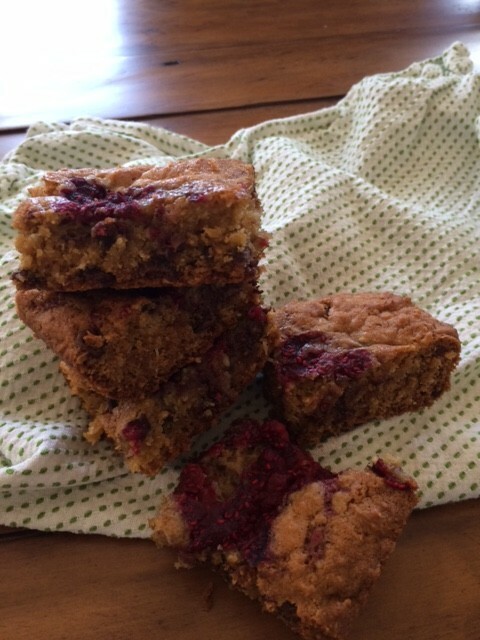 I chose to make bars and added in chocolate chips, organic shredded coconut and organic raspberries (which I pressed into the bars once the mixture was in the pan). My bars took a little bit longer to cook because my oven was being finicky but when the bars were finally ready to take out of the oven they smelled amazing. The final product was filled with flavor, a hearty cookie bar that would be great to throw in my backpack for a long training run or ride. I also love the fact that they encourage you to add in whatever else you feel like adding in. A little creativity in the kitchen can go a long way to fuel your run or ride or just to eat when you feel like devouring some cookies. Here is a video from skratch to tell you a little bit more about their new cookie mix. and then I’ve got a little giveaway so that you can try skratch LABS cookie mix too! 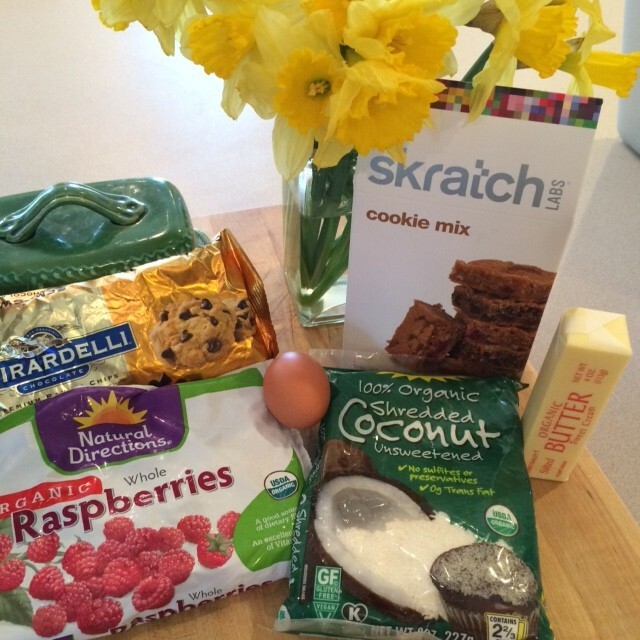 Don’t forget to share some cookies with your friends and to tell me what you would mix in to your skratch Labs cookies! I would mix in sliced almonds, pb chips and chocolate chips! I would mix walnuts or pecans, rolled oats & chocolate chips. I would add chocolate chips with caramel drizzled on top. id add some dried fruit and nuts. Maybe some milk chocolate chips :-). But just a few! How would everyone recommend individually wrapping bars for a ride? I have struggled with sticking to foil, plastic wrap, etc., plus I hate to have the extra trash produced. Suggestions? These sound so easy and delicious! I would probably would add some raisins. My kids would love these! I am a big fan of nuts and raisins and chocolate or peanut butter chips. Mmmm. COOKIES! I’d mix in coconut and pumpkin seeds! I would mix in coconut!!! I’ve heard of Skratch hydration and have been wanting to try it! I would love the cookies…chocolate, PB, and coconut! I just got some samples of skratch and I am excited to test them out. Didn’t know they made cookies. I think I might have to take the plunge here…my youngest son and I are all about the protein! I’d love to try this out by mixing in some chocolate chips. I’d mix in white chocolate chips. I entered the giveaway and hope I win. I want to try this. interesting. i’d definitely add in chocolate chips! These look amazing!! I think I would add some PB2 or almond butter!! Yumm! Natalie recently posted…1 Sentence weekend! The cookie mix looks yummy! I would try that! I would add nuts. Walnuts or chopped almonds would be perfect. I haven’t heard of these! They sound great! Every cookie needs chocolate chips. Just sayin’. Your cookies look delish! Chocolate chips, butterscotch chips and coconut. Maybe coconut and lemon and orange zest. Mmmmm…. Those cookies sound great – I’d probably use coconut and cherries in them. I put coconut and cinnamon in everything! Also might spice it up with some ground red pepper. Pingback: Fresh Review. Skratch Labs Fruit Drops Energy Chews.